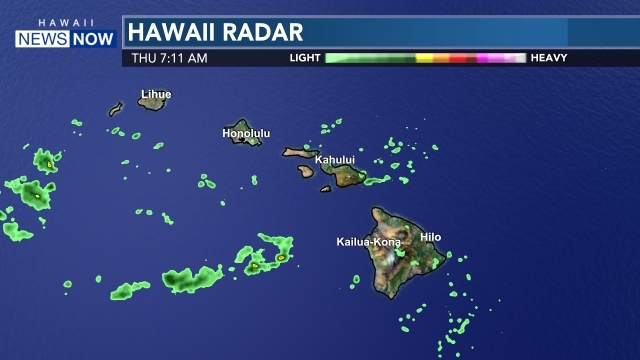 A cold front will push through the islands, accompanied by showers and possible thunderstorms as it moves down the chain, reaching the Big Island late Friday. Winds will become northerly just behind the front, and then trade winds will return briefly late Friday and Saturday. Winds will veer and blow from the south again by Sunday with another approaching front that could bring increasing showers for the western end of the state, reaching Kauai late Monday or Tuesday. The frontal passage will bring some very strong winds for the summits of Mauna Kea and Mauna Loa, where a wind advisory is now posted until 6 p.m. Friday. West winds of 30 to 50 miles per hour with localized gusts to 65 miles per hour are possible. Conditions are also unstable enough that there’s the possibility of snow on the summits Friday as well. We could get an boost in surf for north and west shores to end the week, as a moderate to large short-period swell is expected to peak Friday near advisory levels. This swell is forecast to fade slowly and shift to the north-northwest through the weekend. For mariners, a small craft advisory is posted for coastal waters around Kauai County and Oahu due to the cold front.